We usually think of food as something that brings people together—families warmed by love and memories as they gather at the Thanksgiving table, friends sharing secrets as they indulge in calorie-laden desserts. And culinary mysteries often feature savory descriptions of dishes designed to whet readers’ appetites for both food and murder. Sometimes, though, food divides people, rather than uniting them. Sometimes, it underscores differences among characters, rather than emphasizing what they have in common. Sometimes, descriptions of food make readers recoil and toss their napkins aside. That’s how I decided to use food in my soon-to-be-published young adult mystery, Fighting Chance. The article goes on to explain how the novel uses food to underscore the tensions between the teenaged protagonist, Matt Foley, and his parents. Matt loves his parents and knows they’re good people trying hard to be good parents, but he’s unlike them in important ways and has trouble opening up to them. I hope the characters’ different tastes in food reflect family conflicts in a concrete, humorous way. To read the full article, you can order a back issue at http://www.mysteryreaders.org/Issues/CulinaryCrimeI.html. 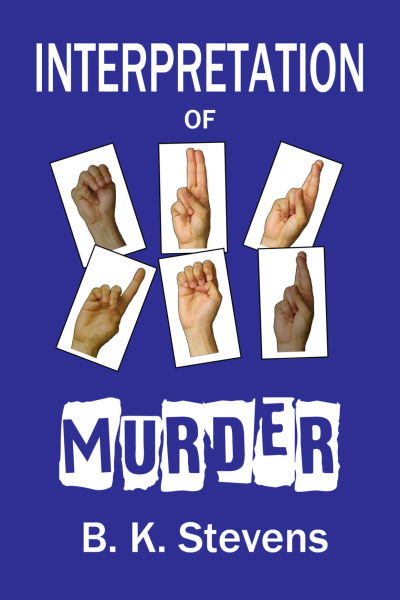 The protagonist of Interpretation of Murder, Jane Ciardi, is an American Sign Language interpreter. On July 15, I visited Lois Winston’s Killer Crafts and Crafty Killers blog to answer five basic questions about sign language interpreting and deaf culture. You can read the post below or find it here Guest Author B.K. Stevens on American Sign Language. Most of the time, to most of us, American Sign Language interpreters are almost invisible. We see them standing near the speaker at a graduation ceremony or a press conference, but once the speaker gets started, the interpreter tends to fade into the background. Sometimes, true, an interpreter is so dynamic that it’s hard to look away. In 2012, when Hurricane Sandy threatened New York, Mayor Bloomberg’s interpreter, Lydia Callis, just about stole the show with her exuberant signing. And in 2013, people again took notice when the man supposedly interpreting for President Obama at a memorial service for Nelson Mandela turned out to be an imposter using nonsense signs. Usually, though, it’s easy to ignore the interpreters who provide a vital service for some members of our communities. Why do ASL interpreters usually wear dark, plain clothing? Interpreters want people to focus on their hands and faces, not on what they’re wearing. That means solid colors generally work better than prints or plaids—hands show up more clearly against a plain background. Interpreters also avoid plunging necklines, bare arms, jangly jewelry, elaborate hairstyles, heavy makeup, even buttons. Anything that might be a distraction could interfere with communication. Why do interpreters sometimes use facial expressions that seem exaggerated? When Sarah was working toward certification and said she was taking a course on facial expressions, I was surprised. But facial expressions, along with body movements, are an important part of ASL. They can indicate tone, intensity, even the difference between a statement and a question. For example, you sign the word “no” by bringing your index and middle fingers down to close against your thumb. If you want to make the “no” emphatic, you might add a head shake, a frown, scrunched-down eyebrows. What kinds of challenges do ASL interpreters face? Also, interpreters often work with deaf people in highly charged situations—when they’re getting bad news from doctors, when they’re being fired, when they’re confiding in divorce lawyers, when they’re telling psychiatrists about childhood traumas. All that can leave an interpreter feeling shattered and overwhelmed by the end of the day. Interpreters face tough ethical dilemmas, too. An interpreter provides deaf people with an essential link to the hearing world. If deaf people fear an interpreter might repeat something they sign, they won’t feel free to communicate without reservations. So interpreters have to keep everything they interpret absolutely confidential, and they aren’t allowed to offer advice unless the deaf person asks them to. If the client is a deaf teenaged girl agreeing to meet a much older man in a seedy motel, the interpreter can’t caution the girl or warn her parents. If a hearing person is luring a deaf person into a financial scam, the interpreter isn’t allowed to comment. These sorts of situations can leave an interpreter feeling shattered and overwhelmed, too. As a hearing person, how should I interact with a deaf person who has an interpreter? It may feel odd to talk to someone who can’t hear you and ignore someone you can see, but that really is the best way to communicate with a deaf person. Don’t tell the interpreter, “Please ask John how he’s feeling today.” Instead, look directly at John and say, “How do you feel today?” The interpreter will sign whatever you say and voice whatever John signs. During the conversation, try to forget the interpreter’s there. Again, that may seem odd, even impossible, but it works. Before long, it will probably start to feel natural. The goal is to communicate directly with John, just as you would with a hearing person. When the conversation is over, it’s fine to thank the interpreter, but don’t try to get him or her involved in the conversation itself. If I encounter a deaf person who doesn’t have an interpreter, should I try to communicate? Definitely. Don’t let embarrassment about not knowing sign language hold you back. Deaf people can feel isolated. When hearing people back away because they feel awkward, that feeling intensifies. So if a deaf person tries to ask you a question or start a conversation, do your best. Write a note on a piece of paper, or type it on your phone and hold it up. Use facial expressions, improvised gestures, smiles. No matter how inept you feel, the deaf person will probably appreciate your efforts—especially if you’ve learned a few basic signs to help things along. If you’re interested in learning more about American Sign Language, you have several options. There are some helpful websites. ASL pro (http://www.aslpro.com/), for example, offers video dictionaries and quizzes that can introduce you to everything from the ASL alphabet to advanced vocabulary and idioms. You might also try books and videos—your public library probably has some. If you get really interested, you can check the course listings at local colleges and community colleges. And the next time you see an ASL interpreter working at an event, consider going up afterwards to say hello. Interpreters can be all too easy to ignore, but they’re fascinating people doing a complex, crucially important job. drives off. She feels helpless, doomed—and at this point, she probably is. But did things have to reach this point? Not necessarily. Not if she had followed some basic principles of self-defense. She wouldn’t have to be an expert. Jane Ciardi, the protagonist of my recently released mystery novel, isn’t an expert. She’s an American Sign Language interpreter who gets into some dangerous situations when she accepts a part-time job from a Cleveland private detective. But she’s taking a martial arts class, and she learns enough to protect herself. ï Be aware of your surroundings. If you’re walking into any situation that could conceivably prove dangerous, focus only on the situation, not on your cell phone or anything else. Before you take one step beyond safety, look all around for possible threats. On a Sunday afternoon, Jane strolls blithely into a parking garage, caught up in her thoughts, and finds herself face to face with someone who wants to harm her. ï Make some noise. It’s easy to be scared into silence, especially if an attacker orders you to keep quiet. But getting noisy is often the best way of getting help. Also, yelling gets your spirits up and helps you feel stronger, and it’ll probably startle your attacker: Attackers expect victims to be passive, so a confident roar might send them running. In the parking garage, Jane ends the danger by shouting a greeting to a stranger passing by. The stranger clearly thinks Jane’s crazy, and maybe the shout wasn’t necessary—maybe Jane’s enemy wouldn’t have attacked anyway. But risking embarrassment is better than risking injury. ï Don’t be predictable. Although any resistance will probably take an attacker by surprise, unexpected moves are especially effective. In our opening example, the woman tries to pry the man’s hand from her arm—utterly predictable, and since he’s stronger, he simply has to tighten his grip. It would’ve been better to pull his hair, claw at his eyes, stamp down on the arch of his foot. In one desperate battle, Jane fights back from a hospital bed, improvising wildly and using everything within reach—including a potted cactus—to defeat an opponent determined to kill her. ï Don’t get in the car. In her martial arts class, Jane learns the Japanese principle of ichi-go, ichi-e—“one encounter, one chance.” In general, it means making the most of any opportunity. Applied to life-threatening situations, it means realizing you may not get more than one chance to defend yourself. If an attacker tells you to get in the car, it might seem smart to obey. Maybe you’ll placate the attacker by cooperating; maybe you’ll get a better chance to fight back later. That’s a mistake. If attacker tries to do anything that will reduce your ability to resist—tie you up, force you into a car—that’s the time to fight back. Fight as hard as you can, as long as you have to, until you can get away. It’s natural to try to avoid fights, and no decent person enjoys hurting somebody. But if your life’s in danger, delay can be fatal. Treat any chance to save yourself as the only chance you’ll get. For all you know, it is. You can learn about more principles of self-defense by reading Interpretation of Murder. (And I definitely hope you do read it!) Undeniably, though, taking a martial arts class is the best way of learning more, and of building the skills and confidence that could make a crucial difference for you some day. Paula Gail Benson interviewed me soon after Interpretation of Murder was released, asking about the novel’s themes and characters. We also talked about my interest in deaf culture, the different challenges involved in writing short stories and novels, and the ways in which members of my family have contributed to my writing. It’s always fun to have a chance to talk about my writing, especially with a good friend who asks such interesting, thought-provoking questions. You can find the Writers Who Kill interview here.